Released on: Frontiers Records. Relase date: Available now. Boy, is there a lot of good albums doing the rounds this year, each year it does seem that the quality of material available in the hard / melodic rock genre, seems to go from strength to strength. 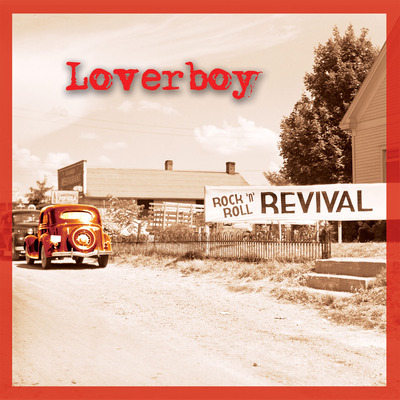 So the thing is who remembers a certain Canadian band from the 80’s by the name of Loverboy? Some people sadly may well say who cares?! Well, the thing is, if you ever liked any of their material back then at all and / or you do like good, catchy and hook laden songs, with big old easy to remember – and sing-along …! – choruses, then seriously, go and track this one down. The band are back together and have been for some time now, minus sadly, long time bassist Scott Smith who was lost at sea in a tragic boating accident, where a freak wave washed him overboard, in a shark infested San Francisco bay, back in 2000. In 2001 the band announced Kenneth "Spider" Sinnaeve as Scott’s replacement and he’s been there ever since. The band is currently on a bit of a resurgence, as they are currently on tour, alongside other 80’s greats, Journey and Pat Benatar. Well, there are three brand new tracks, alongside re-recorded versions of some of their best known songs and other favorites of the bands. Opening with the hugely infectious title track, ‘Rock ‘n’ Roll Revival,’ they don’t hold back and it really is to these ears, as strong as anything like ‘Working For the Weekend’ or say ‘Turn Me Loose’ or any other band favourite. Great start here guys! Then ‘No Tomorrow’ really reminds of some latter years Bon Jovi material. I actually really enjoy this and it’s funny, as I really don’t understand why on the strength of these new songs, why they couldn’t have done what REO, Kiss, Foreigner, Journey, etc, have done with Walmart and negotiated a release of re-recorded hits, plus a full new album and live DVD, in the same triple pack, that those bands have done. ‘Heartbreaker’ is no less strong. It’s different from the previous two, but I think it has just a little bit more modern a pop rock sound, but in a good way. Again, great track. ‘Turn Me Loose’ is the first of these and what I do hear that stands out, is the raunchier intro sound of Paul Dean’s guitar and throughout, there’s a few more little squeals and short breaks from the guy. More emphasis is clear on the backing / harmony vocals and a much richer overall sound. More cowbell please! Certainly the cowbell that kicks off ‘Working For The Weekend,’ is certainly loud and clear. There is clearly more going on with both keyboards and guitars than originally or maybe they’ve just emphasized them a little more on this new version. ‘Lovin’ Every Minute of It’ is next and it’s good but perhaps Doug Johnson’s keyboards are a little more overpowering than they need to be, with Paul Dean’s guitar, a little further back in the mix. What is pretty cool is this new version is significantly extended, with some good interplay between Johnson and Dean, further in. Next up is ‘The Kid is Hot Tonight,’ which is without doubt fuller in sound, with what seems to be a case of overplaying, I wonder how many tracks were used to record each song, especially this one. No question to me that they certainly did put a lot into re-recording this album. It’s ‘Lucky Ones’ next which captures loads of sound sampling and once again reflects lots of extras used in the recording of this new album. Strange choice perhaps next with ‘Always On My Mind,’ from the band’s first album and it’s a track that sounds very different than most of the preceding tracks here, as it’s a lot more simplistic, not too much going on. Easy going pop number, not a power ballad, but certainly laid back. ‘Queen of Broken Hearts’ from the ‘Keep It Up’ album is next and to be honest, it shows that I haven’t listened to Loverboy for some time and seriously, I don’t believe I ever saw the band live, in all the gigs I’ve been to. I didn’t recognize the song until I heard the chorus, then it rang some bells. Remember, I’m from England and these guys were not a band that did much chart wise over there. Another one from ‘Get Lucky,’ in the ballad ‘When It’s Over,’ and again there’s clearly much more going on here, than on the original version, so it sound richer for it. I was a huge fan of one of the bands least successful and very much overlooked albums, ‘Wildside’ and I supposed I would’ve loved to have heard something on here from that, especially the opening track ‘Notorious,’ that was actually co-written by a certain Jon Bon Jovi. Ah well, maybe Jon wouldn’t let them use it again, without a big paycheck for himself! This really is a good album, that I could easily play again and again and in fact, I have done so! Love the three new songs and would’ve certainly preferred a full new album of fresh material over a bunch of re-recorded hits. Maybe they’ll be inspired if they get good live response to the new songs, to do a full new album, I’m hoping so for sure. Final word goes out to the band ... Please record an album of completely new material!